St Petersburg in Russia is not yet a bicycle friendly place such as many European cities like Copenhagen, Amsterdam, Berlin, Helsinki, and many others, but rececently we've started to see some signs of change that makes us think new bike routes will be built in the near future (some trails are already in place, but not everywhere). Getting around St Petersburg by bike is surprisingly easy because the city is compact and flat - plus it can be also a great way to beat the crowds in the summer. But at some point, you will have to deal with the wild Russian drivers who don't really care about bikers or pedestrians. Honestly, that would be the main issue you may experience when riding a bike in Russia. It is a problem that can be overcome, but only if you know where, when and how to move around the city. Despite the changeable St Petersburg weather, its rough roads, bad drivers, and the current lack of bike lanes, cycling is becoming very popular in the north capital of Russia, particularly in the summer time. Personally speaking, if you want to bike safely along the Neva River in the light rain on a white night and enjoy a pleasant ride in the central part of the city, then hiring a local guide or going with a friend will be your best option. This way you're sure to have peace of mind! How much does a Bike Rental cost? 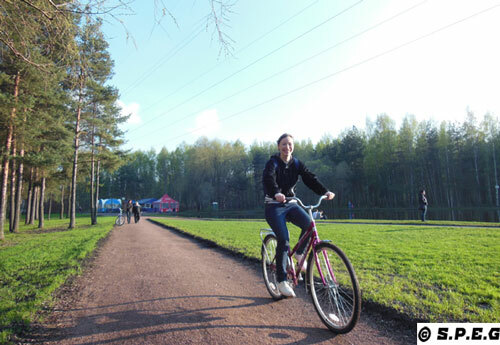 Have you decided to go by bike in Saint Petersburg? If so, keep reading below. Me and Anastasia with our bikes at the Dacha. Both of us (David and Anastasia) love bike riding during the weekend, and we are pretty sure that many more people out there love to go cycling as much as we do. We usually like to ride bikes at the Dacha or in the parks near where we live. In both cases we prefer to go cycling during the famous White Nights in the summer or throughout the beginning of the golden fall, when outside it's pretty warm and the sky is always blue. Due to several reasons (bad roads, bad drivers, lack of bike signs, etc), for first time visitors getting around St Petersburg by bike alone is still not yet as safe as it should be, so it is not really advised. Nevertheless, if you know where to ride a bike, and you come at the right time, with the help of some locals, then it could be a pleasant and unusual experience that we are sure you won't regret. Therefore, an easy way to experience a safe and joyful bike ride through the never-ending sunset of the city of bridges, stunning riverside views, and graceful canals is to rent a bike from one of the several bike rentals in St Petersburg and preferably go with a guide. 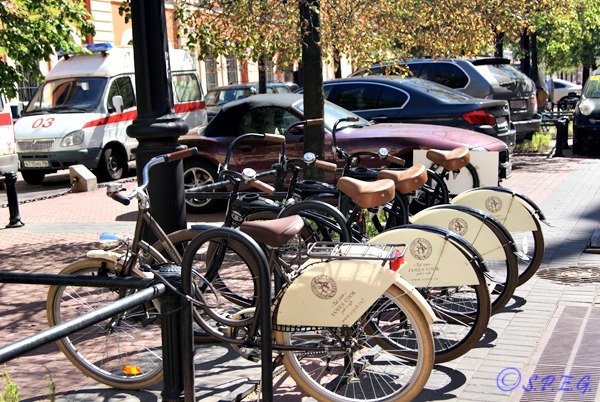 Renting a bike in the cultural and historical city of Peter the Great varies according to which bike rental company you choose, and for how long you want to hire a bike. Normally the price will range from 400 to 600 rubles (€10/$13 - €15/$20) per day or from 250 to 300 rubles (€6.00/$7.00 - €7.00/$10) for one hour. A deposit is always required before you rent a bike! Bike Trail in St Petersburg, Russia. Instead of renting a bike on your own, why not take a Bike Tour and enjoy an unforgettable experience. If you fancy the idea, then book with us before you come and cycle around the city upon your arrival actively and safely along with an expert local biker. Wondering where to go in St Petersburg by bike? So, if you really feel like going cycling in the cultural and fascinating city of St Petersburg, then the safest places to ride a bike are the city parks or near the embankments of the Neva River. 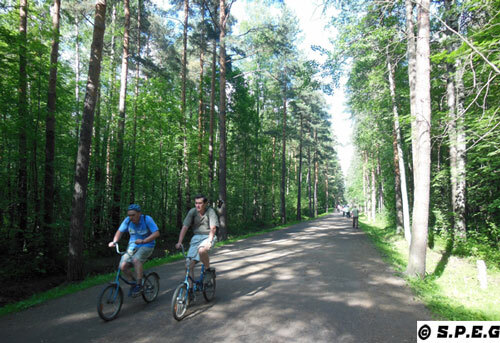 In fact, the city of St Petersburg has numerous beautiful parks of different sizes that most of Petersburg residents use to go for walking, cycling, skating and relaxing. In addition to that, there are also the charming riversides of the Neva. These are the best places for cycling or for walking in peace and on your own. Anastasia biking in the park in St Petersburg. Of course you can also go by bike in the central streets of St Petersburg, but you will have to take some precautions. In the event you go on your own, then be careful of Russian drivers. Most of them are terrible! As we said early the easiest way to go would be to hire a tourist guide or someone who knows where to go. Wondering when is the best time to go by bike in St Petersburg? As this Russian city experiences traffic jams on weekdays and the weather is unstable at certain periods of the year, we think that the best time for getting around St Petersburg by bike is on a Saturday or Sunday, from the start of the summer until the start of the fall. So, from May to October, preferably in the morning or evening. With so many places and wide flat spaces, the city of St Petersburg is actually a perfect place to ride a bike, but only during the summer. However, in order to experiencing Top St Petersburg attractions with off-the-beaten-track spots and still feel safe, then remember that a tour bike guide is a good idea. If you would like to go by bike alone instead, no worries, but ride along the Neva’s embankments, in the parks or in the quieter side streets of the center (avoid the main roads). As there are few bike trails in St Petersburg, locals ride their bike on the sidewalks, so you will too. But when doing it, don't go fast, and respect the pedestrians. Find a bike rental company that can provide you with a good bike equipped with keys, helmets, maps and everything else you may need to enjoy your bike ride. From St Petersburg by Bike return to Travel in St Petersburg or go to the Homepage.